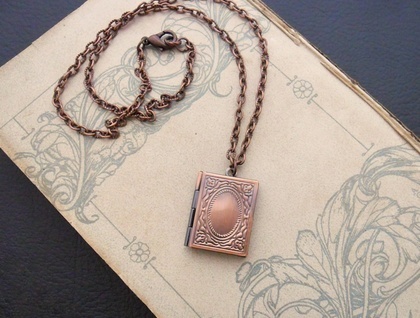 A highly detailed, book-shaped locket on a vintage style, antiqued-copper coloured chain. 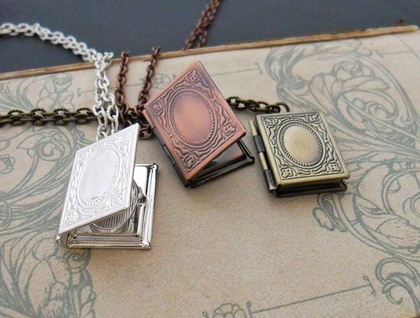 The high quality locket is plated with copper, and has been antiqued (artificially aged) to show up the decoration on all sides. 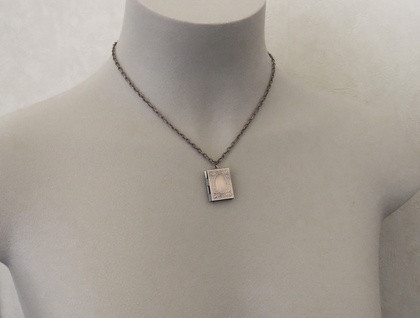 The back of the locket has a simple pattern of many fine, vertical lines. It opens and closes beautifully – it won't slip open by itself, but neither will you ruin your fingernails trying to open it! It sits flat when fully opened, and inside it are two oval spaces for two images or photographs, measuring 15mm by 9.5mm. You could also add a tiny piece of fabric or ribbon, a lock of hair, a note, or some other small thing. I recommend adhering your treasure to the inside of the locket, or stuffing it in securely, to be certain that it won't come loose and work its way out. The chain is iron based and antiqued-copper in colour, with textured, oval links. The necklace fastens with an antiqued-copper coloured lobster-claw clasp, which clips into a small, twisted ring. Please note that while the first photograph shows three different lockets, this listing is for the copper-plated one in the centre. The brass plated and silver plated lockets are also available here in my Felt shop. The necklace measures 44cm, including the lobster-claw clasp. 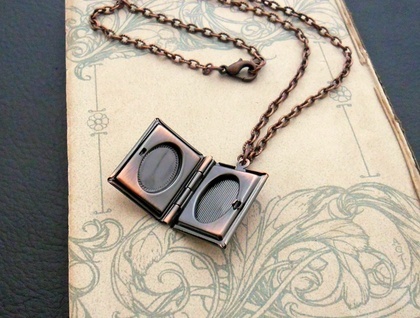 The locket measures 23mm lengthwise, not including the baile (the little hanging loop at the top), and 19mm across.